Welcome to our eighth Quality Account for Ashford and St Peter’s Hospitals NHS Foundation Trust. 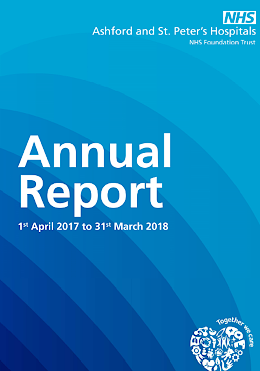 This is an annual report to the public about the quality of services that the Trust delivers and describes just how important we consider patient experience, quality of care and safety are within the hospitals. Our Trust Strategy was last refreshed in 2013 and the time is now right to re-assess our vision and strategic direction to ensure that colleagues and our local and national partners and stakeholders are working together to create an organisational infrastructure and culture aligned to meet the needs of the community we serve. The new strategy which centres upon what is needed to achieve our vision of providing an outstanding experience and the best outcome for patients and the team is now ready for launch in May 2018.